In many situations, there will only be one choice on your travel route. Sometimes there are multiple closely spaced Supercharger locations that allow you the luxury of selecting a specific location. There are several strategies to consider when you have multiple choices. Select the location that leaves you with the lowest State of Charge (SOC), along with some safety buffer. This is a good choice for longer trips, as the charging is fastest at low SOC levels. Select the location with the most free stalls. This avoids a potential wait, and you’re more likely to find a pair of stalls that are free, which speeds your charging. Select the location with the amenities you want such as restrooms, food, coffee and shopping. You can see Supercharger information on the navigation map by tapping any red Supercharger pin. It shows the total number of stalls, those that are free, and a list of amenity icons. All other Superchargers in the area will also show the stalls open and in use (with up to a 5-minute delay). At a busy Supercharger, you can often dramatically speed your charging by picking the right stall. At an empty location, any stall should offer the maximum charging speed. At a busy one, if you have more than one choice, the wrong choice might take you considerably longer to charge! Each group of two stalls are connected to a single V2 Supercharger cabinet. Each cabinet has a number and the pedestals in each stall are labeled with that number and A or B. Now for maximum charging speed, you want to select a stall where you will be the only vehicle at A and B for that Supercharger cabinet. When vehicles occupy both stalls for a single Supercharger cabinet, the power is divided between the two vehicles. The first vehicle gets the most power, but the second vehicle will get at least 30 kW. As the first vehicle charges beyond 50% SOC or so, the power is tapered down to protect the battery. The excess capacity is then diverted to the 2nd vehicle. When the first vehicle completes charging or leaves, the second vehicle gets the entire capacity of the Supercharger. 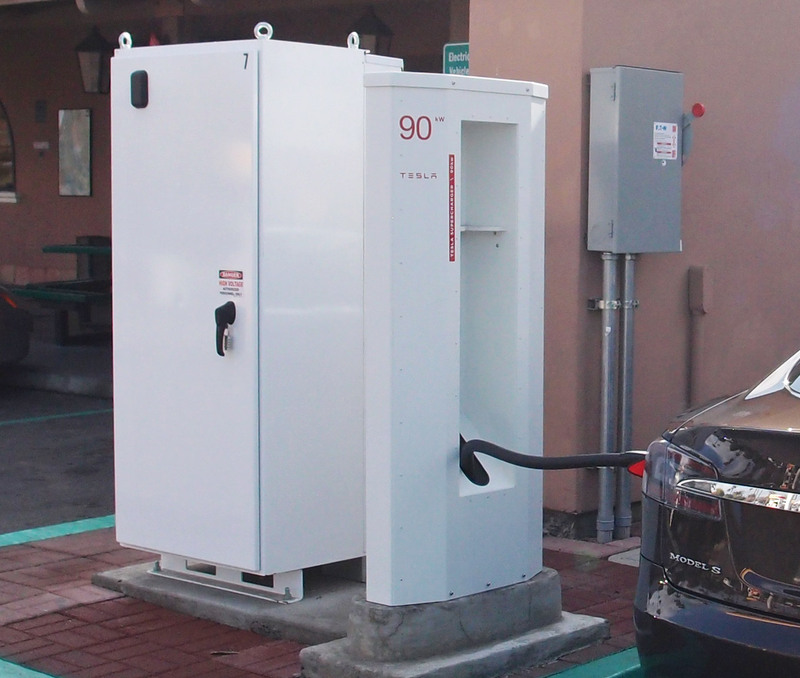 In most locations the A and B stalls for the Supercharger cabinet are adjacent to each other. You do have to look, as some locations seem almost random as to the stall layout. If the only open stalls are ones that have a vehicle in the adjacent pair, look for a stall where the vehicle that has been charging for a while. This is not easy to determine, short of asking drivers that might still be in their cars or nearby. Another trick is to choose a stall where the adjacent vehicle is a Model 3 SR or a S/X 60 or 75. All these will top out at 105 kW, which means more power for you sooner. If you find a V3 Supercharger, each stall can get up to 250 kW, and due to the design, there is no sharing to worry about, so you’ll get the maximum possible for your car. More on V3 Supercharging below. Tesla vehicles with a trailer pose a tricky problem at Superchargers. Clearly you can detach the trailer and use any stall, but in some locations, it may be possible to keep the trailer attached. It’s also possible in some locations to go across a long group of stalls to charge, but it blocks other vehicles from using those stalls. Only do this if there are plenty of other open stalls available for other owners. Please be considerate. Also check out this list of trailer friendly locations at TMC. The easiest way to open the charge port door on any Tesla is to press the release button on the charging connector. On some vehicles you may need to press the button while holding the connector a foot or two behind the door or above it so the vehicle’s antenna sees the signal. You can also release the door from the Tesla app on a smartphone. Select CHARGING and tap the UNLOCK CHARGE PORT button. On the Model 3 and the Tesla Semi there is a small Tesla logo that lights up to the left of the port. On the S/X the ring around the charging port changes colors to indicate what is going on. In European S/X, the charge indicator to the right side with 3 LEDs (not shown). Deep Blue Connected, not charging Indicates the charging will start at a later preset time. Green – Pulsing Connected, charging Pulses slow down as it nears completion of charging. Amber – Solid Not fully plugged in Remove and insert. Amber – Blinking Reduced AC charging Possible line voltage sag at higher currents, so power was reduced for charging. Red Fault See instrument cluster for description of the error. No charging will occur. 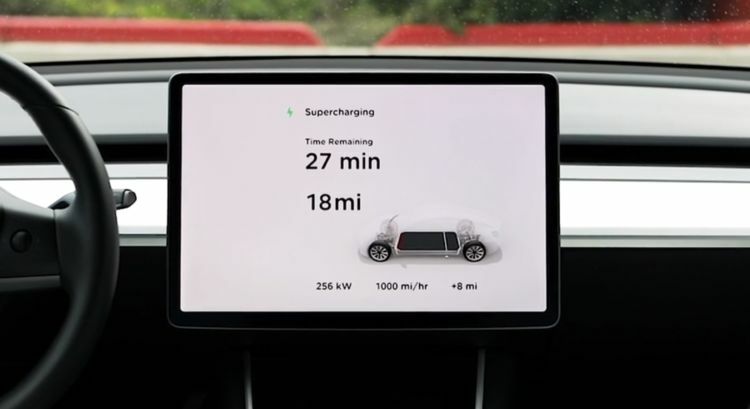 When charging, the main and instrument cluster screens will show various charging information – including an estimate of how long it will take to reach your desired charge level, the current percent of charge (27%); what SOC it will stop charging with the white triangle indicator (100%); The current charging rate, how much has been charged and the average rate of charge since starting to charge in miles per hour (94 kW, 1 kWh and 241 mi/hr). 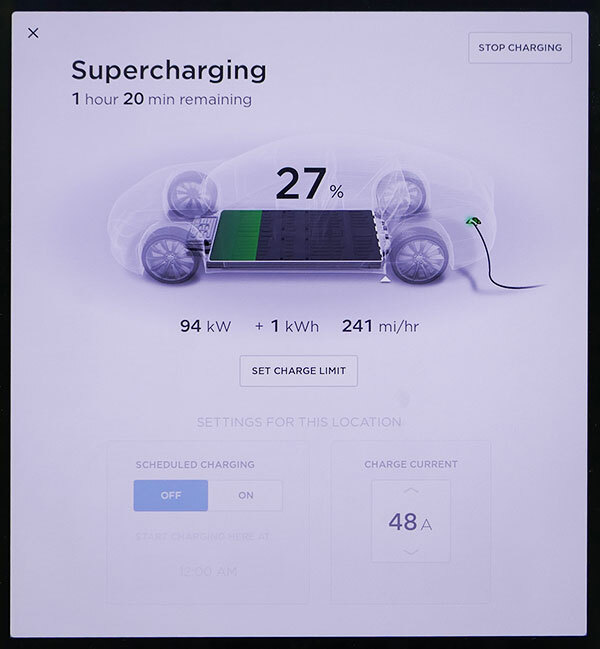 To minimize the time at a Supercharger, if the last 20% of range or so is unnecessary, stop charging earlier to dramatically reduce the charging time. We’ll talk more about this below in the Tapered Charging section. I recommend checking the screen (or the phone app) a couple of minutes after you connect to a supercharger. In rare cases the charging may stop or have a much lower power than desired, and it’s best to know about it quickly so you can resolve it. The vehicle battery pack size and battery cell design limits the maximum charging power. Unless otherwise stated, maximum charging power is DC via the Supercharger. 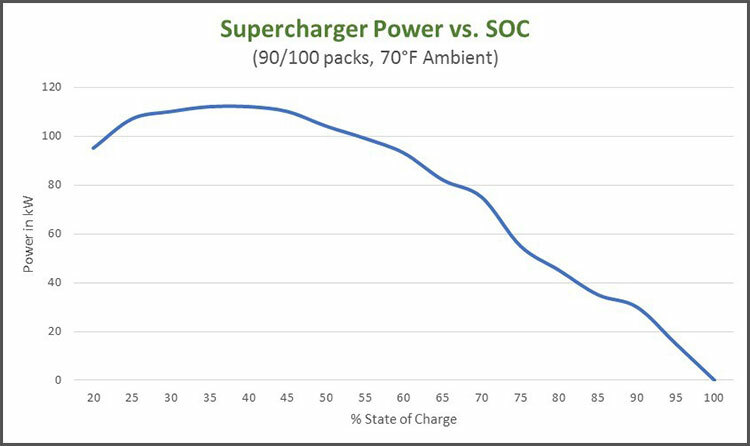 Tesla changes the amount of power used to charge up the pack, depending, in part, on the State of Charge (SOC). When the vehicle is below 45% SOC, the taper curve starts at 10-15 kW below the maximum, and quickly move to the maximum power, where it starts to taper off around 45% SOC and drops to zero when fully charged. This means is you get the fastest charging when you are in the range of about 20% to 55% and then it slows down the closer you are to 100%. When travel requires multiple Supercharger stops, the best plan is to stop charging when you have enough power to reach your next charging stop, plus a 10-20% reserve. Of course, in very cold weather a larger reserve is necessary. The chart above is for the 100 packs made today. The 75 packs follow a similar curve, but is limited to 105 kW max. The 2nd gen 60 packs are really a 75 pack and charge at the same rate as a 75. This special case stops charging when the real pack SOC reaches about 80% SOC, and is shown within the vehicle as 100% SOC. Most older packs with the original battery formulation, such as the 40/60 (1st gen)/70/85 start to taper off earlier. Tesla uses this technique to provide the fastest charging without damaging the batteries or reducing longevity. A typical consumer item like a phone, usually charges at the maximum rate from start to finish, which often leads to the battery degrading quickly, and needing replacement in a couple of years. The best case is shown above in the tapered charging graph at 70°F. If the battery pack is either too cold or too hot, the power will be further reduced until the pack temperature gets within the safe fast charging range. 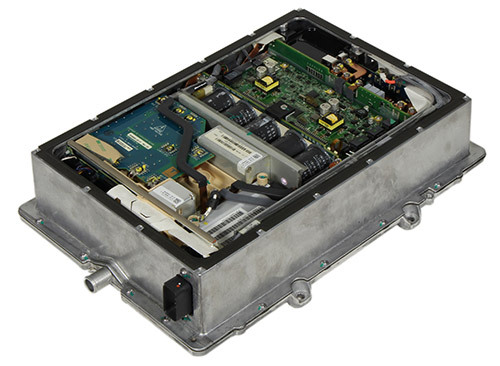 The vehicle’s HVAC system is used to cool or heat the battery during this period. Charging at the best rate usually occurs within 5 to 10 minutes. 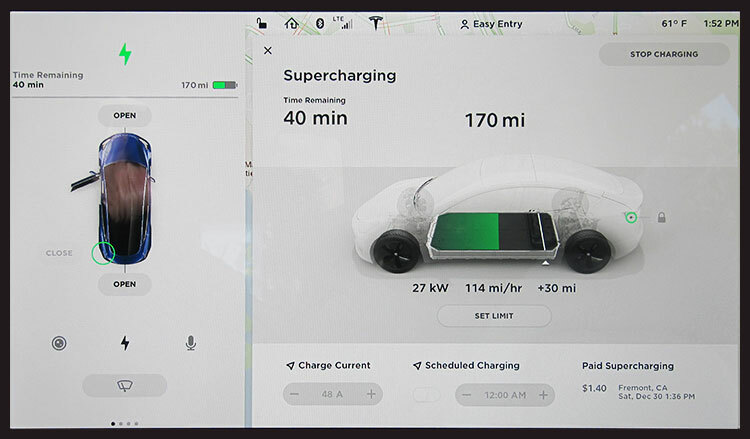 Tesla is rolling out a new feature to all cars in Q2 -2019 to heat the battery if necessary when navigating to a Supercharger and you get close to the Supercharger. This insures the charging can begin at the maximum rate for the SOC. While rare, the Supercharger itself may limit the power if its own electronics are too hot. This is fairly rare, but might occur if ambient temperatures are above 110°F and 100+ kW is being drawn from the Supercharger cabinet. All owners are subject to an idle fee, if you remain parked after your vehicle has finished charging. There is a 5-minute grace period. If the car is still not moved Tesla will charge you $1.00/minute ($60/hour) from when the vehicle completed charging. The fee is waived if the Supercharger is less than half full, but it still common courtesy to move your car once charged. You can use the Tesla phone app to alert you when charging is complete, with notifications. Depending on the vehicle and program you are in, there can be a use fee. These vary by state, province and country. It is usually billed by kWh consumed, but a few areas require billing by time. Pricing is quite low, often lower than residential rates, and far cheaper than gas or diesel for the miles traveled. For more on fees, visit Tesla’s Supercharger Support page. Tesla announced the new V3 Supercharger, that uses a single cabinet to handle 1 MW of power. It can distribute up to 250 kW per vehicle. It begins rolling out in Q2-2019. The LR Model 3 can take advantage of this extra power with a charge rate as fast as 1000 miles per hour. Other models will get faster charging rates too, but numbers have not been disclosed yet. For the Model 3 LR, this equates to 75 miles of charge in 5 minutes. Since the maximum power can be provided to each stall, there is no longer a concern about which stall to pick on a V3 Supercharger. All cars benefit from this change as well. For vehicles with higher power requirements, there may be a new connector. For example, the Semi prototype has a large connector that has data pins and 4 sets of high voltage connections. This may represent charging 4 packs within the semi, each at 250 kW. It’s our guess that a slightly different v3 Supercharger variant will be provided for Semi charging. 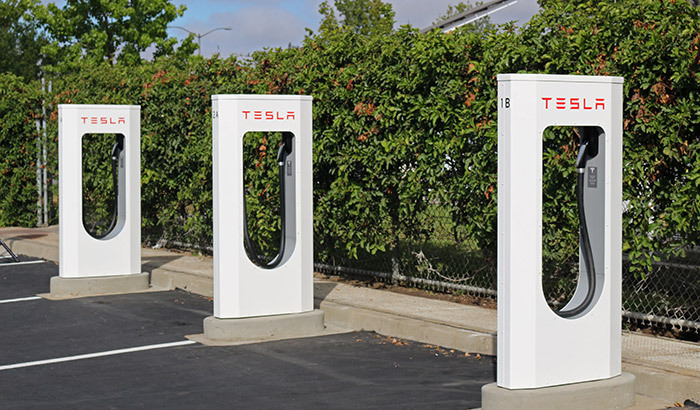 The first 6 supercharger locations appeared in the fall of 2012 in California. These all maxed out at 90 kW, which was also the limit of the first Model S battery “A” packs. In the Spring of 2013, Tesla introduced the 120 kW Supercharger to match the charging ability of the newer S85 at that time. It has undergone many small design tweaks over the years, to the newest style with the illuminated “TESLA” on top as shown at the top of this article. All 90 kW Superchargers have been replaced now. 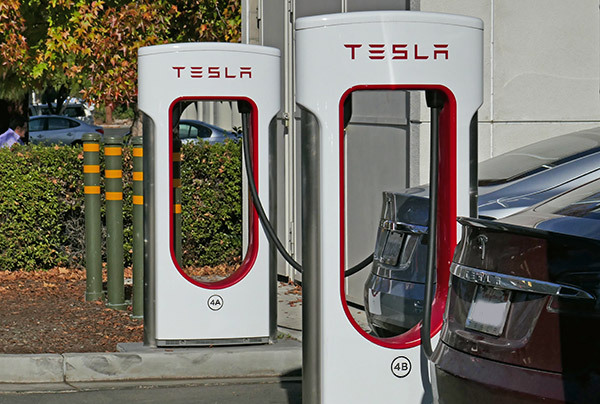 For a few months, Tesla tried out a liquid cooled Supercharger cable in Mountain View, CA. These cables were noticeably thinner and easier to handle. They did work, but at some point, Tesla reverted to the prior design. Perhaps they were not as reliable. Sometime in 2016, Tesla introduced a Gen II Supercharger, with 135 kW power. Each vehicle is still limited to 120 kW, but it will charge two vehicles sharing the same Supercharger slightly faster. We suspect there is still a mix of 120 to 135 kW Superchargers, but in our 2017 travels, we couldn’t find a 120 kW Supercharger. 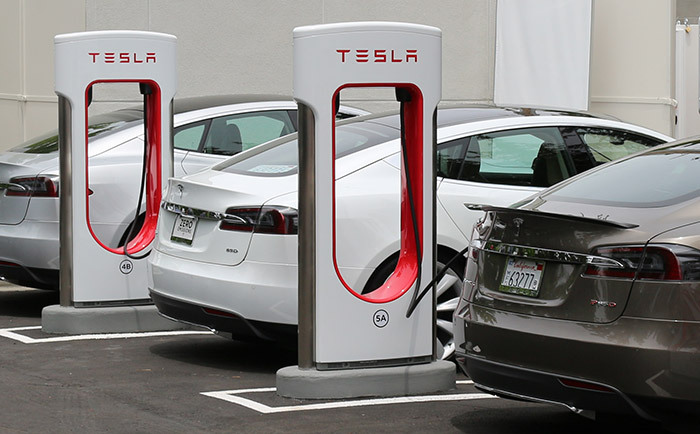 In late 2017, Tesla introduced an urban Supercharger that is limited to 72 kW. This appears to use a 145 kW Supercharger cabinet for two pedestals, but is configured to split the power evenly all the time. You don’t need to worry about which stall to choose. A new smaller pedestal design also appeared with the urban supercharger. 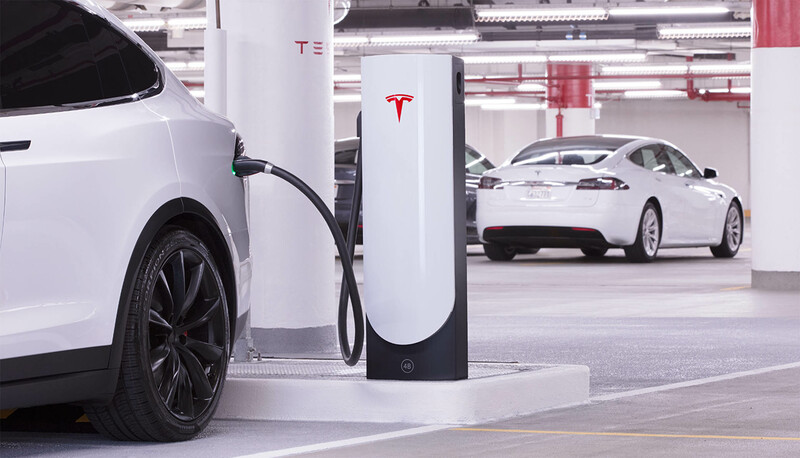 In March 2019, Tesla introduced the new V3 Supercharger, a 1 MW cabinet that can provide up to 250 kW to each stall without pairing. This will be rolling out to new Supercharger locations first. 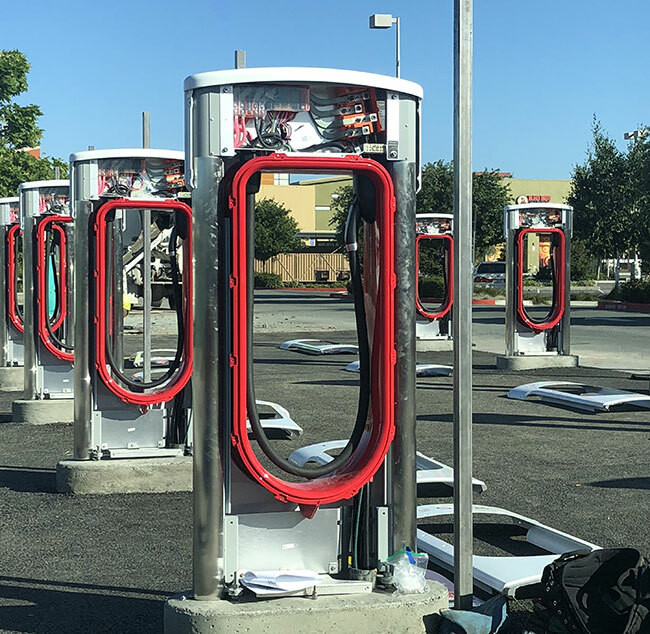 At the same time, Tesla is increasing the maximum at existing V2 Superchargers to provide up to 145 kW to select models such as the Model 3 LR via a software update in early Q2-2019. There are 12 chargers within the cabinet along with a couple of large circuit boards. In the 120 kW Supercharger, these charger units were like the ones in the pre-refresh Model S. (i.e. 12 * 10 kW = 120 kW). The European chargers were rated at 11.25 kW as are the newer 48-amp S/X chargers. Twelve of these yields 135 kW total power. The newest urban chargers appear to use a 145 kW cabinet. The Supercharger can route power in 1/12 increments to either the A or B pedestals. Each charger module is liquid cooled. It’s unclear if a refrigerant cooling system is used, or just a pump/fan/radiator system. We suspect the latter. The cabinet uses 3-phase power at 277V per phase, or also called 480V. To get 480, multiply 277 by the square root of 3. 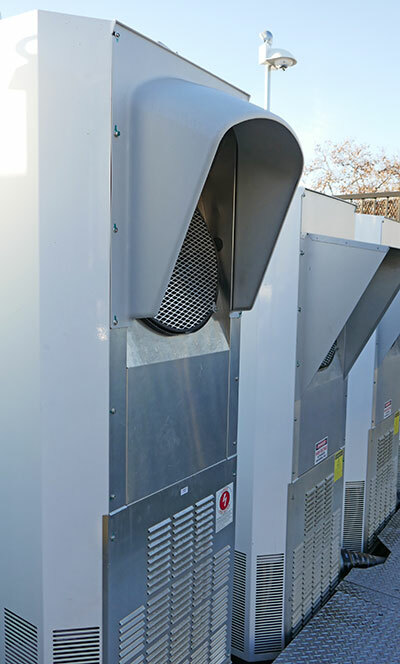 A typical 480V installation is supplied power through a 250 amp 3-phase breaker. A single cabinet weights 1320 lbs. The Illuminated “TESLA” at the top is backlight with LEDs that in total take 4.3W. From the Supercharger Cabinet to the Post has 5 signal wires, a low voltage line, and four high power DC lines (doubled power), and two grounding conductors. These are fed through a 3” diameter conduit. The cable to the connector uses two sets of two smaller high-power DC lines, a ground, and 2 signal wires. This is routed to the 5-pin connector (North America and Asia). Europe uses the 7-pin Type 2 Mennekes connector. Q: How long to charge? A: This depends on the current state of charge, charging power and what level you set to end charging. When you start charging, within a couple of minutes, the instrument display and the Tesla phone app will show how long it is expected to take. Q: I’m having trouble getting the charge connector in (or removing it). How can I fix this? A: First the ring color must be white (or light blue) to insert or remove the connector. If any other color, depress the button until the color changes and then insert/remove. If the vehicle is new, some charge ports are very tight. You might need to apply quite a bit of pressure. Usually within a month it becomes easier. If it truly is too hard to use, contact service to have the port replaced. In all cases, check if the connector is damaged or dents in the connector. Although rare, in a few cases a Supercharger connector was dropped, denting the connector edge. You can try another stall. It’s helpful to alert Tesla to the issue with the location and pedestal id, like “4B”. 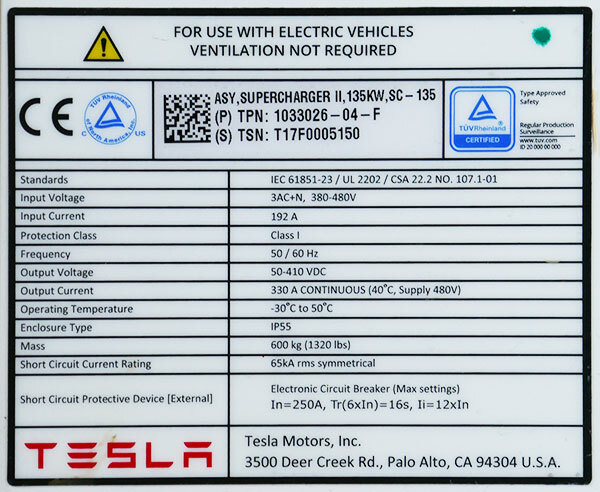 An 800 number is listed on the Tesla pedestal. When trying to release when pressing the connector button, if the port will not unlock (turn light-blue), try using the fob (Model S/X) by holding the trunk button in for 1-2 seconds. On rare occasions the charge handle button just doesn’t work. Q: The charging seems quite slow – what can I do? A: This could be normal. If you are the 2nd vehicle connected to the Supercharger, you may get a low rate (see Picking the Right Stall at the top). If you are above 70% SOC, this also limits the charging speed (see Tapered Charging above). Lastly it could be the battery is very cold or very hot and the temperature must be brought within band to allow charging at the full speed (this is all done automatically). In rare instances, there could be a problem with the Supercharger. If there are other stalls free, you can try another stall. It’s helpful to let Tesla know about problems. They are very proactive in keeping the equipment functioning properly. Q: Why are the fans running in the front of the vehicle while charging? A: When either the outside temperature is hot, and/or the battery gets hot from fast charging, the battery is automatically cooled by turning on the AC and the fans in the front of the vehicle. Sometimes this can be quite noisy, if maximum cooling is required. 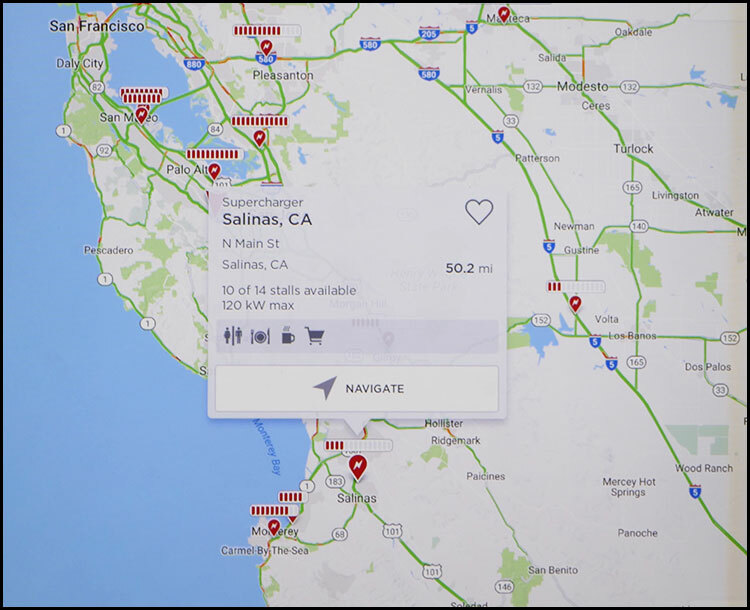 Tesla Interactive Supercharger Map – You may need to first log into MyTesla to view this. Tesla Trip Planner – Enter start and end locations, and it does the route with Supercharging stops and the estimated time to charge. Does not support discontinued models. This is a great one-stop-shop for everything Supercharging.